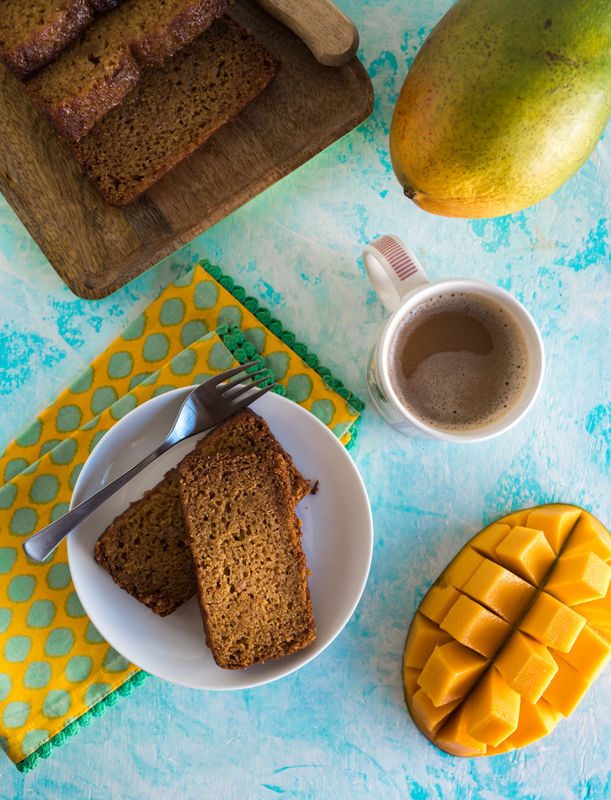 Mango bread has taken the place of banana bread in our house, hearts and stomachs ever since we had in it Maui a couple years ago and again in Kauai this past summer. Made with Chosen Foods Avocado oil to keep it extra moist and delicious. 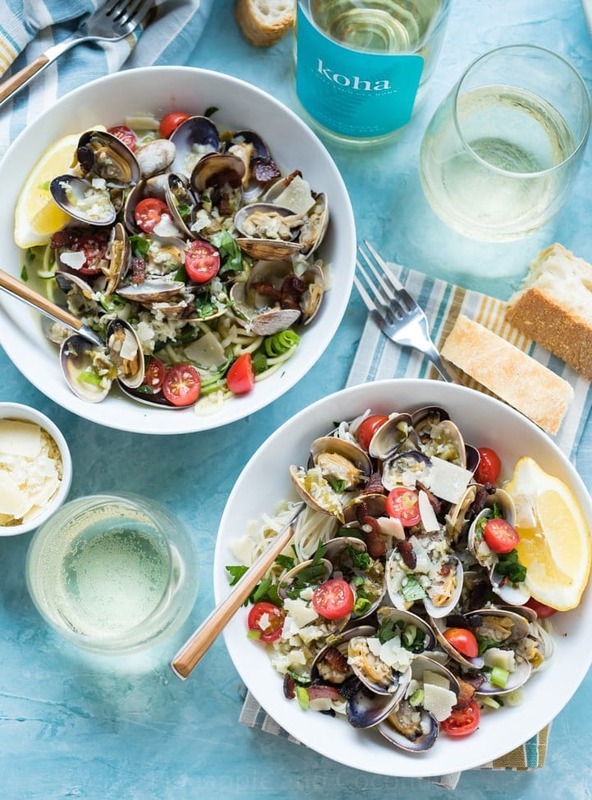 I am a Chosen Foods ambassador and received Avocado Oil from them to make this recipe. When we went to Maui two years ago we sampled banana, mango, lilikoi and guava breads during our trip. 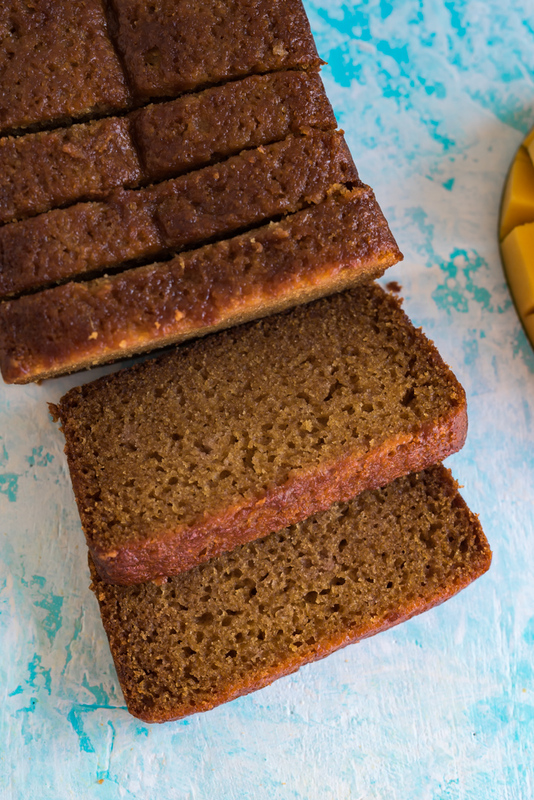 Maui is known most for its famous banana bread that you pick up on the way to Hana to snack on while your drive through the 600 turns of the Hana highway. You can also find it at various farmers markets on the island and we found the best mango bread at the outdoor market near Leoda’s pie shop on the way to Lahaina. My kids couldn’t get enough of it, neither could I. Leoda’s pies are amazing too by the way. A MUST stop on Maui. 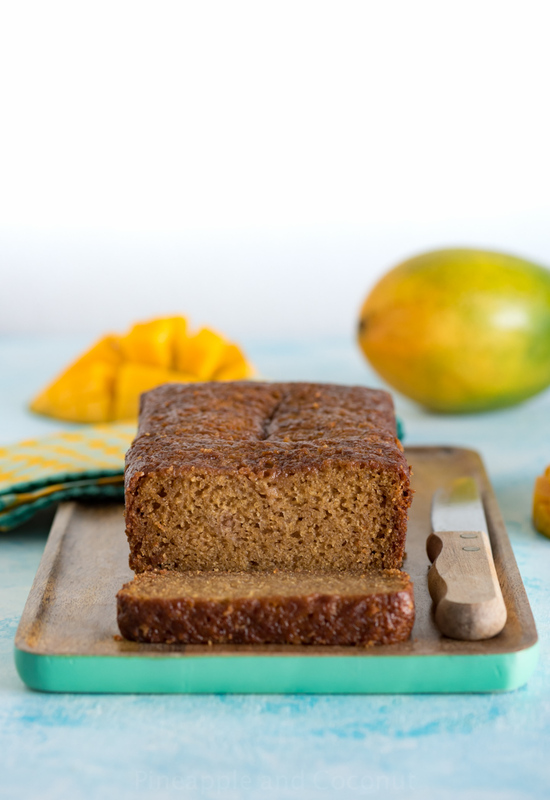 When we got back from Maui I looked for mango bread recipes online and the ones I found never quite ended up the same as the ones we had on vacation. I tried making substitutions with banana bread recipes, but still, not the same. I made a plan to look for more Hawaiian cookbooks on our next Hawaii trip. I try to hunt down vintage cookbooks every trip to Hawaii. Usually from thrift stores. Kauai has an amazing book store and I made a point to visit it when we went this year. 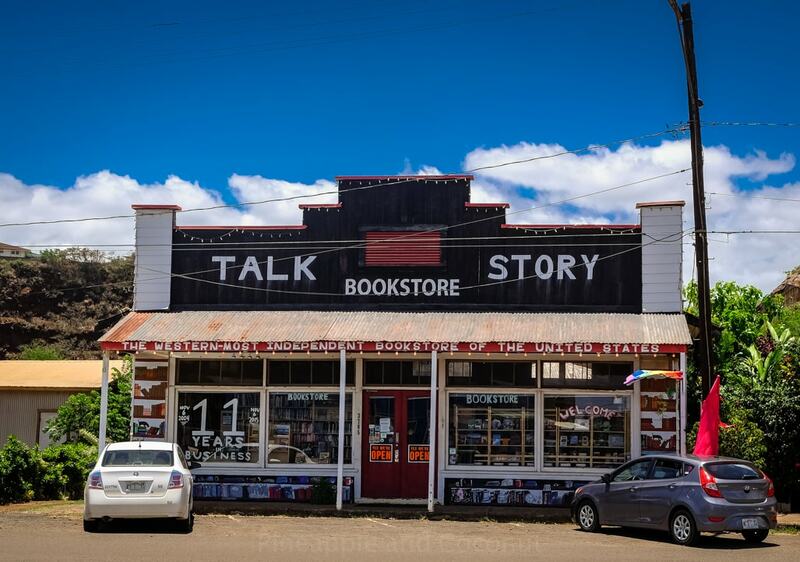 Located in Hanapepe, the Talk Story bookstore has the claim to fame of the western-most independent book store in the United States. They had everything from new to old, children’s to adult fiction, popular and hard to find. Lots of Hawaiian guide books as well as a huge section of Hawaiian cookbooks. I was in cookbook heaven. I decided on three, since suitcase room was dwindling due to many other purchases already made that trip. Two of the cookbooks I found had mango bread recipes in them and I couldn’t wait to try them at home. I got out all my supplies and ingredients and started up with one of the recipes. Simple ingredients, even more simple directions – “Combine everything and bake”. I whipped up the batter and filled my pan. And boy do I mean filled. Recipe yield stated one loaf so I poured it all in my loaf pan. EEP. It was about a quarter inch from the top and I hoped that the bread didn’t rise too much during baking. It did. Luckily I placed a baking sheet on the oven rack below it in case any batter spilled over. There was too much batter and after an hour and 15 minutes I thought it was finished baking but it wasn’t quite done. It tasted great, close to the bread we had in Maui, but the middle was a little underbaked. Since the flavor was so great I decided to give the recipe another go. This time splitting it into two loaf pans. Flavor still there, but the loaves were very small and I would have over-baked had I not watched them closely. I could have photgraphed them for this post but since they were such squat loaves, I decided to give it the old “third time’s the charm” and try one more time. Third time was most definitely the charm. The bread is dense and moist, baked to the perfect height and so flavorful. Exactly like the bread we had on Maui and Kauai. Delicious. Two gorgeous loaves, one to eat now. One to freeze and save for later. Like. Next week. In a medium bowl whisk together the flour, sea salt, baking soda and cinnamon. 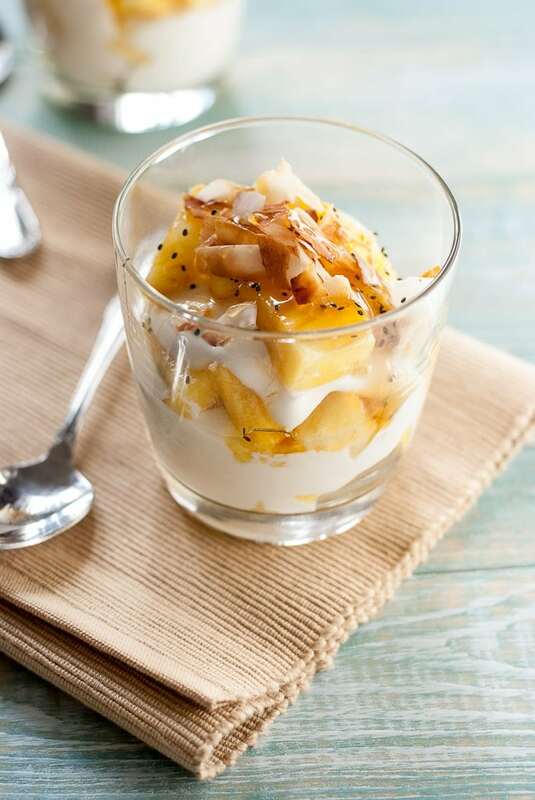 In a large bowl mix together the mango puree, sugar, avocado oil, eggs, vanilla and rum if using it. Mix until well combined. Add in the flour mixture and stir until moistened and only a few flour streaks remain. Do not over mix. Divide batter between pans. Bake for 55-65 minutes or until a toothpick placed into the center comes out clean and only has a few crumbs on it. Cool in pan 10-15 minutes then remove to a wire cooling rack and cool completely. Wrap in foil then in an airtight container. Will keep well 3-4 days at room temperature or up to 3 months frozen. 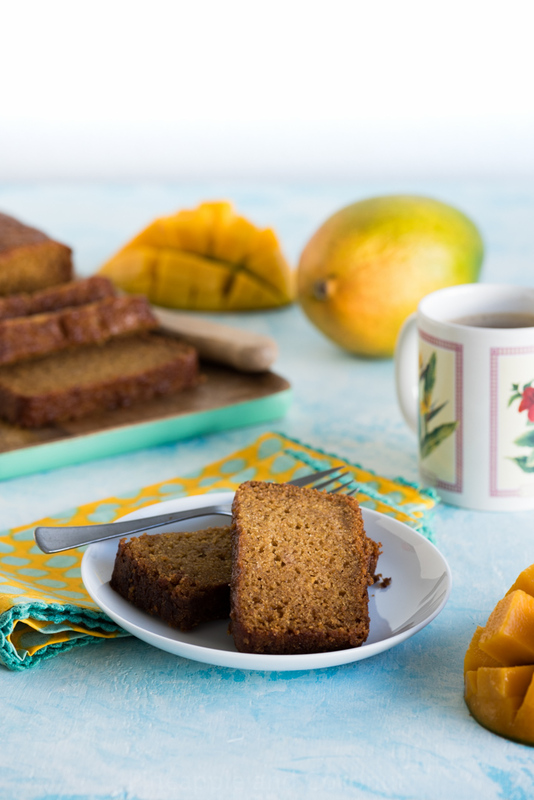 Serve the mango bread with fresh Kauai coffee and a good book. 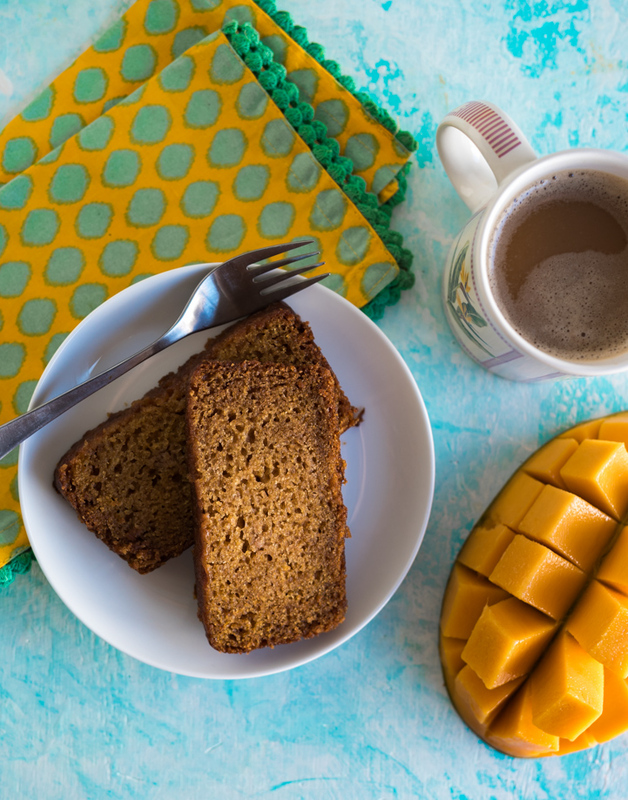 I love this mango bread at room temperature but slightly headed with a little slathering of butter or cream cheese is super tasty too. Thanks again to Chosen Foods and like always opinions are my own. I appreciate the support from all my readers helping make my blog possible so I can continue to bring you amazing recipes and have the ability to work with amazing brands. This is the absolute best bread I have ever tasted! It was gone in less than an hour. Now I’m making four batches for my family. Thanks for sharing the recipe. It is amazing how fast it disappears! I am so glad you loved it! Do you know who the original author of the recipe is/was? I have some beautiful Hayden mangoes from my friends tree. The ones that drop/fall to ground are picked up daily, looked over for splits (they get thrown away), and those that are good, get cut up and saved for bread or cake. I couldn’t find my aunties famous recipe, so I decided to search, I knew the ingredients, just couldn’t remember the ratios. 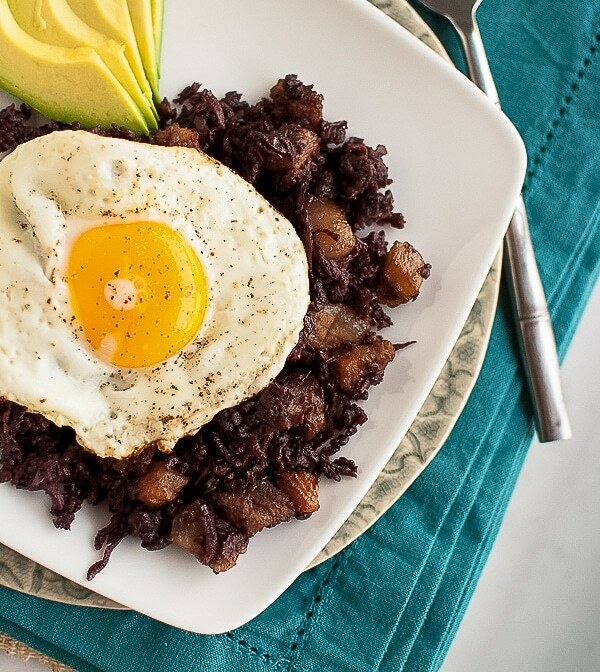 Mahalo for posting this recipe. I’m off to conquer my craving for mango bread. Aloha!! I used “Best-Tested Recipes of Hawaii” cookbook that I had found at Talk Story Book Store. Author is Margaret Kepka Stone. Copyright of the book is 1984. 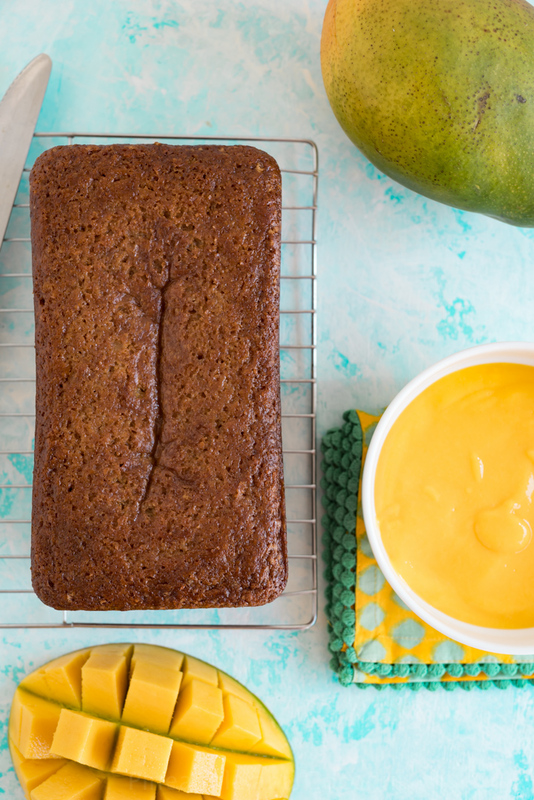 This recipe really tastes just like the mango bread from roadside stands in Hawaii. Let me know how you like it!! I am a Floridian who has an amazing mango tree that produces an abundance of fruit. 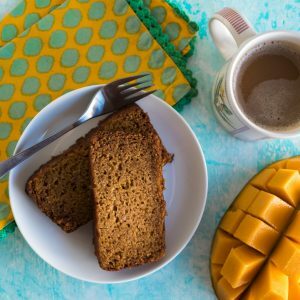 Searching for a moist, tasty mango bread led me to this recipe. 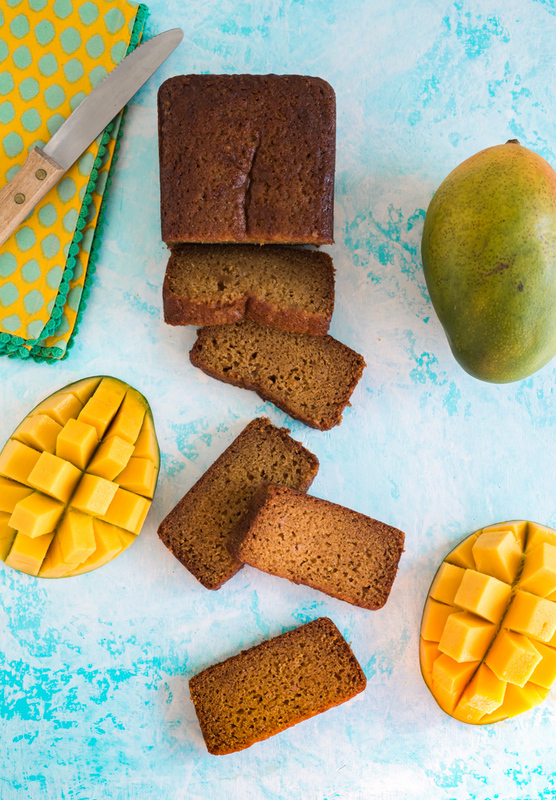 It is by far the best bread recipe to do the juicy, mouth watering mangos from my tree justice. My question is about the mixing of the flour with the wet mixture. You say to not mix too much but I find that if I don’t, it clumps and can leave an occasional flour blob. Is there a secret or tested method to mixing that won’t yield those unsightly blobs? Most consumers of the bread just tell me to mix better and throw that part out. I’d rather not have them though. Thank you for the recipe and for your response. Definitely mix to get rid of the flour blobs but don’t mix too much more than that. It will over develop the gluten and make for dense, tough bread. I hope you like the recipe! !